Myelopathy is caused by direct compression of spinal cord in cervical spine. In this pathological condition, patients develop motor weakness of upper and lower extremities, painful numbness of upper extremity as well as gait difficulty. Radiculopathy is caused by direct compression of the cervical nerve root. Those who suffer from arm pain or numbness may be common as cervical radiculopathy. First, a small incision is made around neck skin. From there, we reach to cervical vertebrae by following tissue boundaries. This way, we can avoid possible damages to muscles if done otherwise. 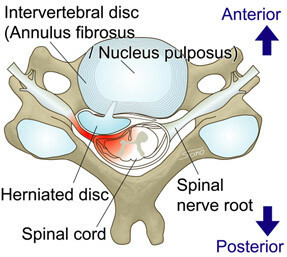 Intervertebral disc is removed to pull out herniated disc. 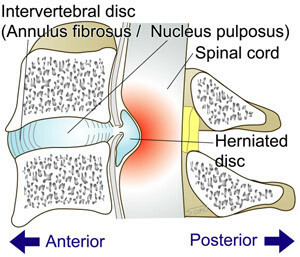 After spinal nerve is decompressed, screw-like metallic implants called cages are inserted to the disc space to fuse upper and lower vertebrae. 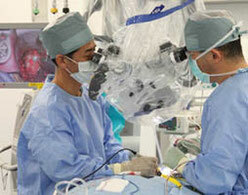 This procedure enables patients to leave their beds early after operation.